The “standard” method is basically to mix baby cereal with breastmilk or formula, beginning anywhere from four to six months. You slowly thicken the cereal over time until baby is pretty good at eating off a spoon, then you introduce pureed foods one at a time, waiting a few days between each new food to check for reactions. The baby-led weaning method is based on the premise that babies’ stomachs aren’t developed enough to handle solid food until at least six months, but once they are fully developed they can handle real food, not cereal or puree, and they simply eat what you eat. The concept is that once your baby can a) sit up unsupported and b) grab things and put them in its mouth, it’s ready to start trying food. You start by cutting food into stick shapes, about an inch wide and three or four inches tall – double the size of baby’s fist, essentially, so they can grab it with their whole hand and have some sticking out above that chubby fist to gnaw on. They learn to explore food under their own power, and are in control of their own eating experience. They are more willing to try new things if they’re the one in charge of picking it up and putting it in their mouth, basically. They also develop an understanding of how to move food past their tongue and swallow better if they are the one holding it. What really sold me on BLW is the words “they feed themselves.” As I was wondering how I would ever eat myself in between spooning things into two babies’ mouths, the notion was revelatory. A lot of people refer to BLW as ‘the second/third child method’ – in other words, it’s what happens when you have another kid and your first one hands over their food or the baby steals it off the family’s plates when you’re not looking. It’s been happening for ages. 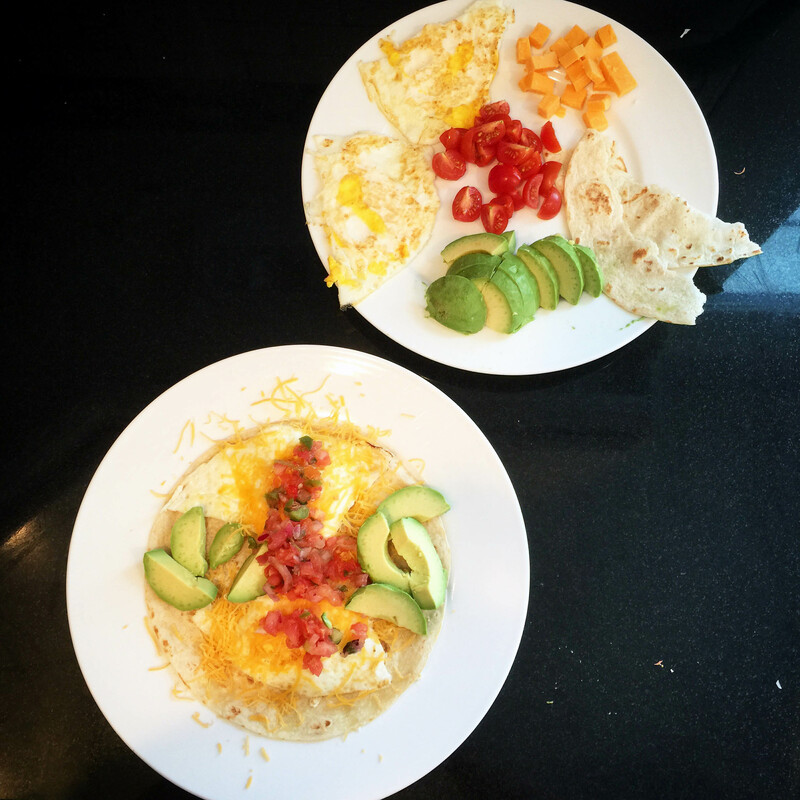 Here’s a recent lunch – huevos rancheros for me (bottom) and them (top). You will notice that some components of the meal are shaped a little differently for me and for them, but it is entirely the same meal. At eleven months old, I would say that between the two of them, my children eat the same amount as one normal-sized adult most days. They also still nurse; BLW subscribes to the same philosophy that solid food is for ‘fun’ before one year as the “standard” method does; they still get a great deal of nutrition from breastmilk and love to nurse. I would say, based on my interactions with other BLW moms (there’s a huge BLW contigent on Instagram, if you’re looking for ideas and support), that my kids eat a little more than the average; they will cheerfully eat an egg and a half each at lunch, whereas I know several children who are months older who still don’t eat one whole egg themselves. One factor may be that the twins night-weaned very early; they sleep through the night without nursing, so they only nurse during the day, which means their consumption in general is a little less spread out and they may be hungrier. Alternatively, they might just be big eaters like their parents. Thus far, there’s almost nothing they haven’t liked – they certainly have preferences now of things they really love, but there isn’t anything they’ve refused. Spicy foods make them cry, but they’ll still keep eating them (weirdos); we just make sure to have some yogurt or avocado nearby if we know we’ll be serving something that might be a little spicy. And they’re getting used to it – enchiladas last week brought on nary a tear as they were gobbled up. Baby-Led Weaning was absolutely the right choice for us; it may not be for you. We are lucky not to have any food allergies on either side of our family, so we were comfortable diving in quickly. Many people use a hybrid method, using both purees and BLW. Different approaches work for different people. We’re all just trying to feed our kids good food. Enjoy it!